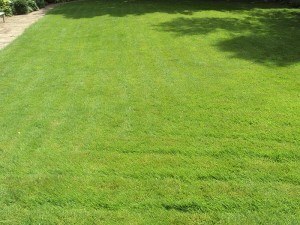 Figure 2: The client’s lawn following treatment. 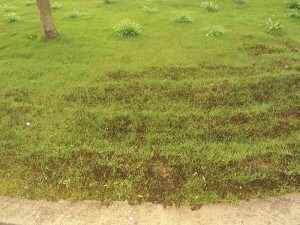 This client’s lawn was seriously affected by moss. 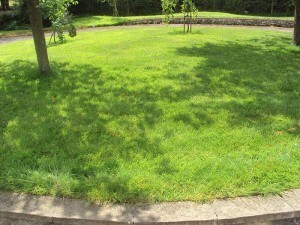 Their excessive moss problem was caused by a very wet area in their main lawn where a soakaway was located. Their raised lawn area was also seriously affected, particularly that which was adjacent to the retaining wall, where periods of hot and dry weather had led to the soil drying out. These two very different conditions were both negatively affecting the soil. With too much moisture and not enough drainage, moss was allowed to thrive and the lawn was weakened as a result. Too little moisture had led to a weak root mass with little opportunity for the grass to root in soil that was easily blown away. 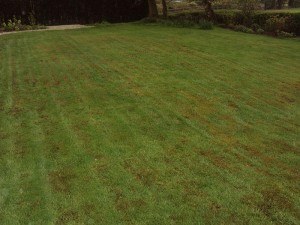 Once we visited this client’s lawn, we quickly determined the need for scarification in both areas. As a result large volumes of moss were removed, with a digester being used to complete the removal of moss. We also aerated both lawns using the solid tine method, which worked to promote stronger root growth as well as improve the drainage in the main lawn. In addition to scarification and aeration, we also applied fertiliser and weed treatments. When autumn and winter arrived, we applied treatments both to prevent moss, and to harden the grass. Following the removal of moss, the client’s lawn became noticeably thicker. Due to the improved grass growth and a denser root system, the wet area in the main lawn became firmer and healthier. The dry area near the retaining wall was restored to its lushness and health following the application of fertiliser treatments in the previous autumn and winter. Is your lawn’s health being compromised by moss? 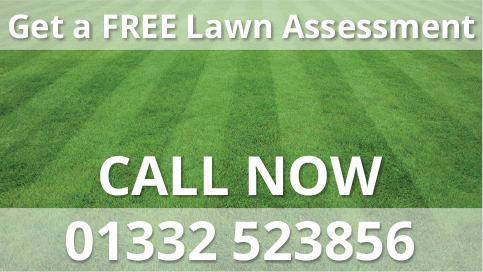 We can help you restore your lawns former lushness and strength. Visit our contact page to get in touch via email, or call us on 01332 523856.